I first met Hawanatu Bangura in Sydney at an industry panel discussion on the lack of diverse Muslim representation in Australian screen culture. Later we shared stories about our experiences growing up in vastly different parts of Africa, laughed and made jokes about awkward cultural exchanges we've both experienced, often being the only non-whites and Muslims within our circles in Australia. In between the banter, we talked about our mutual love of films—her energy amplifying when she spoke about the way storytelling has shaped her. I clearly heard the echoes of determination and sensed her conviction, as she expressed to me she wanted to make films for social change. Fast forward to 2018: "I want to tell stories about my community that mirrors our diverse experiences and not leave it up to the majority to continue telling our stories from their perspectives," she tells me in a phone call. It's this unassuming conviction that underscores the tone of her films at the same time eminently drawing audiences into a world they wouldn't otherwise experience. With 6 short films under her belt, Sierra Leonean Australian filmmaker Hawanatu Bangura, is one to watch. 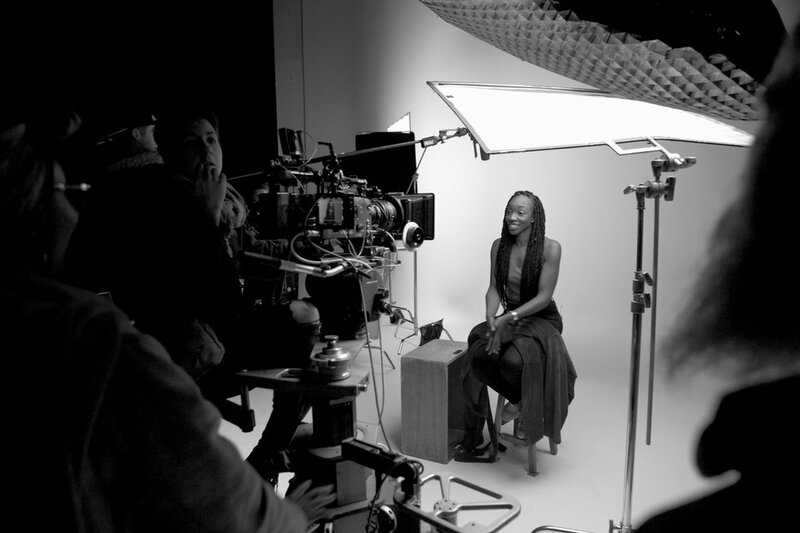 Her latest film I am Black and Beautiful screened at the Toronto International Film Festival for Kids last March. She's currently part of the prestigious Screen Producer's Australia: Ones to Watch Program. In addition, Bangura's developing her next two projects; a documentary on the experiences of people with a disability from non-English speaking backgrounds and a dramedy web series set in an African Australian female hair salon. On top of her creative pursuits, Bangura is a qualified social worker currently working as an advocate for people with a disability. Bangura developed an appetite for filmmaking in high school after being exposed to the medium through a program at a local youth centre in Sydney. However, her love of storytelling ignited during her childhood in Sierra Leone. She often sat with her family by the fireplace, listening to stories about moral dilemmas which were used as a means of teaching values and ethics. Later on, storytelling became an escape during times of adversity. In recent years, her social work has had the strongest impact on her as a filmmaker. "My experience as a social worker plays a major role in my approach to filmmaking," says Bangura. "I make films about social issues that sometimes directly affects the people I work with who are usually marginalised." Despite Australia's 40 000 years of Indigenous history and the richness of it's cultural diversity resulting from immigration, in 2018, the country's mainstream media is still markedly culturally homogenous (insert white). Bangura's "I am Black and Beautiful" is a documentary about a group of African Australian women who explore the impact of western beauty ideals on their identity. Seven women with origins from different parts of Africa reveal the impacts that whiteness and it's cultural constructs of beauty has had on them as individuals growing up in a predominantly white society. "I wanted to make a film that will inspire young black women to embrace their black beauty," says Bangura. "I've had many conversations with black women with shared experiences about feeling insecure as a black girl due to their hair, dark skin, etc. I became more curious about it, as I was one of those girls." The script was born from a workshop to initiate dialogue with African Australian women about their experiences growing up as black girls in Australia. Shot in black and white, these stark visuals are married with an ethereal music composition capturing the rawness, at the same time balancing the sensitivity of the women's experiences and its influence on their self-images and personal identity. The filmmaker weaves into the narrative images, Afrofuturist in tone, of young black women in traditional face makeup, dancing, alluding to internal struggles, progress and re-imagining ideas of beauty. "It's suddenly an exciting time to be a female filmmaker in Australia as things are starting to shift," she says. "People from marginalised communities are now being more included in the film industry. However, the competition to attain these opportunities is still high. I've started to make films that resonate with me instead of waiting for success that's defined by other's standards." The filmmaker's next creative developments include a short documentary, still in it's infant stage, which will explore the triumphs and challenges of people with a disability from non-English speaking backgrounds in Australia. The other project, Afro Sistahs, a dramedy web series delving into the lives of four young African-Australian women who meet regularly in the 'Afro Sistahs' hair salon in Western Sydney, supporting each other through everyday experiences, cross cultural barriers and bad hair days. The proof of concept is scheduled for release in the second half of the year. "The web series stems from our desire to bring to the Australian audience a humorous, thought-provoking and sassy story that partly reflects our lives and captures the diversity within the African-Australian population". "I'm at a stage in my career where I feel valued and seen. I want to tell bold heroine stories that will inspire young women to dream big!". Check out Afro Sistahs on Instagram and on Facebook.